The Venezuelan government says several military officers have been caught passing state secrets to the US. Vice-President Jose Vicente Rangel said some "low-ranking officers" had passed information to the Pentagon. Some of the individuals concerned had been detained and some had left the country, he said. Ties between the US and Venezuela were already under strain. 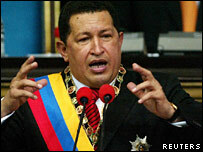 Washington is deeply opposed to the government of left-wing President Hugo Chavez. Mr Chavez accuses the US of supporting attempts to overthrow him, which the US denies. Washington has expressed concerns about Venezuelan democracy under Mr Chavez and about the effect of his government's military purchases on regional stability. In early January Mr Chavez accused the US of blocking the purchase of training jets from Brazil because the planes contained protected US technology. The US had objected to a decision by Spain to sell jets and patrol boats to Caracas. The vice-president did not disclose the number of people involved in the alleged spying, or the kind of information they were said to have passed on. Press reports said that those detained were naval officers. A spokesman for the US embassy said officials had received no communication from the Venezuelan authorities and it was an "internal matter" for Venezuela.